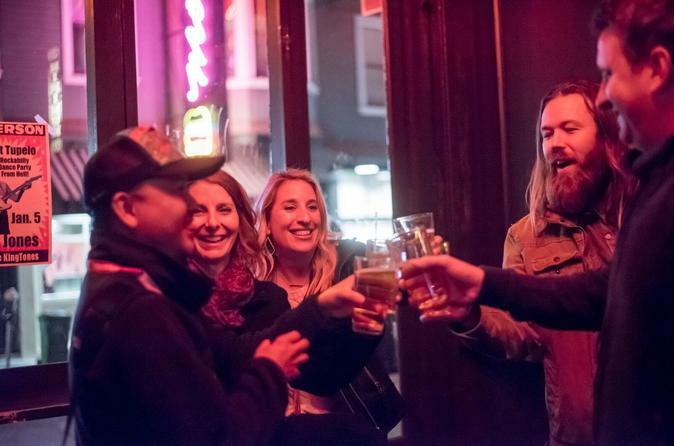 Explore some of San Francisco's best bars on this pub crawl through the vibrant district of North Beach! You'll discover the legendary and sometimes-quirky watering holes that make the city’s nightlife scene so unique. On this 2.5-hour small-group walking tour, stroll the streets of this festive neighborhood and taste local wine and beer. Don't miss the chance to end your day by the bay in true San Francisco style! Your San Francisco pub crawl begins at Vesuvio Café, a famous café that many literary geniuses used to frequent. Here you'll have ample time to enjoy an Anchor Steam Ale, which has been locally produced since 1896, or a glass of wine from California Wine Country. As you soak up the atmosphere of this bohemian hangout that inspired a generation of writers from the Beatnik generation, you'll see photos of influential actors, writers and authors on the wall. Next you will walk by a number of bars and sidewalk cafés, taking in the local flair and learning about the history of the neighborhood. You'll visit places such as an off-the-wall pub decorated with forgotten maritime trinkets and a bar that claims to be the city's oldest pub and hosts flourishing jazz performances. Later into the evening you can down an espresso in a traditional Italian café that plays classic jukebox music or even serenade the house at a local karaoke bar! With a maximum of 12 people, this small-group tour ensures a personal experience so you can get to know your fellow travelers as you wind through North Beach. Your tour will conclude in Washington Square, where you may continue exploring North Beach on your own. Walk to Coit Tower, take photos of Saints Peter and Paul Church or return to the sidewalk cafés in North Beach for dinner.